Happy New Year to everyone. I hope 2013 brings all good things for you. 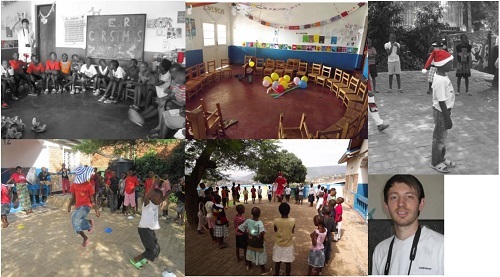 While I was away in the UK the children enjoyed some exciting times, first with Vincent and John, and then with Andrew and Richard, who came out from the UK to extend the holiday school. We are so very lucky to have such wonderful people who give up their time for the children. Below is a letter from Richard, telling you what they got up to and how he felt about the experience. “If I told you that instead of celebrating Christmas on 25thDecember I was sitting in the kitchen for most of the day doing nothing I’d expect your reaction to be, ‘oh, what a shame’. If I told you that Christmas Day was the worst day I had all December you’d probably be thinking either, ‘what went wrong?’ or, ‘the rest of the month must have been good!’ The second response sums up my time at Meg Foundation perfectly. I spent four weeks there this winter with my friend Andrew Storey and not once, other than on Christmas Day, did I wish I was anywhere else. For the last eighteen months I have spent one day each week in a primary school in England and I have a reasonable knowledge base of what goes on at school and how teachers go about their job. What I haven’t got is experience of teaching in a classroom and being responsible for all the children in it, but when the opportunity to go to Kigali and volunteer at Meg Foundation for a month opened up to me there was no way I was going to be put off. As a wannabe teacher I knew it was a fantastic chance to get some time being at the front of a class that I just can’t get in England, but more importantly I knew there was a lot of responsibility lying on my shoulders to make sure that the children had a fun summer holiday whilst making the most of having some real life muzungus (white people) to ask questions of and learn from. On arrival I quickly realised that Meg Foundation was far better equipped than I imagined it would be, albeit nowhere near as well off as any English school, and this filled me with confidence for the teaching I was soon to begin. The unknown is always a scary place, but travelling with a friend provides comfort, and being greeted by an American man, John, who has been there for a few months and knows what he is doing, offers assurance. I met some of the staff and was immediately struck by their friendliness and helpfulness and it only adds to the feeling of being needed and valued. It also builds up pressure, but as daunting as it is you know that you’re in a safe and hospitable environment. The teaching was to begin the day after I landed so there was little time to prepare. A good n ight’s sleep was in order to calm nerves and ready myself for the day to come. There was, of course, no need to feel uneasy as once the children arrived I remembered what I’ve come to realise the more time I spend in schools: children are children are children. There are noisy ones and quiet ones, tall ones and small ones, inquisitive ones and shy ones, boy ones and girl ones, and once you know this and remember it you can work with any class in any country. The only difference between these children and the ones I encounter in England is the huge divide in financial and social circumstances, but you don’t notice it at school because they are just so happy to be there. School began at 9:00am, but every morning children would arrive at school before 8:00am because the Foundation is a place where they feel safe and welcome and they all want to learn and have fun. This is perhaps a sign of their home life because they would rather be at school but it’s also reflective of Meg Foundation and its incredible influence on the local community and the esteem that surrounds it. Most people we talked to outside of the Foundation had heard of it, even when we were not in Kinamba. The children know its reputation too and they understand how fortunate they are to be able to attend this terrific institution. More days than not there would be parents coming along trying to enrol their child into the nursery, but I fear that most of them were unsuccessful owing to such a high demand for places. The teaching days followed the same pattern each day with Primary 2 and 3 attending from 9:00am – 12:00pm and then Primary 4 and 5 in residence from 1:00pm – 5:00pm. Apart from age the main difference between the children in the mornings and the afternoons was the language barrier. Understandably the younger children’s English was not as good as the older children’s, but this is where the school elevated itself above any English school I know. Three of the older boys from P5 spent their mornings helping translate our instructions for the younger students and that is the most valuable asset that is available to the people at Meg Foundation: selflessness. These boys were on their summer holidays and should only have spent the afternoons at summer school but instead chose to give up their time to help the new Englishmen out. It is a trait we found in more than one place in Rwanda as we were never short of somebody who wanted to help us out (admittedly it was sometimes in return for a fee, but mostly it was because people are very friendly). We wouldn’t have been able to teach the younger children effectively at all had these boys not given up their time so willingly and for that Andrew and I are very grateful. With the assistance of The Three Musketeers we had great fun with P2 and P3 who, whilst being large groups and boisterous at times, were nonetheless lovely children and threw themselves into all the activities we planned for them. We taught lots of English, did lots of colouring and learned lots of songs, courtesy of Andrew’s Kingswood camp days. I think the stand out game for them all was ‘Head/Catch’ whereby if we threw the ball at them and said, ‘head’, they had to catch it, and vice versa. They loved it and were always begging us for one more round. The simple ones are always the best. This game was also popular with the older children, and as the weeks progressed each game lasted longer and longer as they got better and better at it. The older children were in some ways easier to teach because we could do more advanced lessons and games owing to their age and better knowledge of English. Due to those reasons and the class sizes being smaller we both found it slightly easier to get to know the P4 and P5 children, but this is not to say that we felt in any way disassociated from the younger children. The simple fact is that I am used to working with the older primary age groups and was naturally better at getting to know them. The highlight for me was showing them my favourite experiment, demonstrating how much space gas fills by popping a camera film case up into the air and watching as they all yelled in shock. They’d never seen anything like it before and I enjoyed showing them the practical side of learning. I think they grew in confidence as the weeks elapsed because at first it was difficult to get a sound out of them in the classroom but by the end there were far more hands in the sky as they endeavoured to answer my questions. That’s what I wanted to achieve and looking back I think I was pretty close to it. Having blindly travelled 4000 miles with only reservations and no expectations I am now ashamed that I ever had doubts. Whenever I think back to my time in Kinamba I can see only the smiling faces of 60 children who know the importance of an education and will arrive at school over an hour before it begins. I mentioned that I thought the children grew in confidence during my time there, and I’ll tell you another thing: they’re not the only ones.